I was in the office supply store today looking at the aisles of paper-based materials and hard goods that I no longer use, and I found myself contemplating the rolodex as an object that was once used primarily to organize one's social network. As a method for locating one's acquaintances it is remarkably egalitarian, because all possible contacts are equally ranked in its structure. 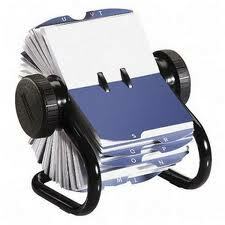 Unlike the more hierarchical spreadsheet on which I tend to depend for managing large numbers of professional contacts the rolodex has no top or bottom. The rolodex is also fundamentally different in its structure from the selective invisibility of the social graph with which Facebook operates. On social network sites frequent status changers are much more visible. The site might remind us periodically that we have lost contact with Person X, with whom we can't imagine being spurred to spontaneous verbal interchanges by such messages, but those who are intermittent updaters and contacters tend to disappear.